All mechanical, hydraulic and electrical components manufactured in compliance with the respective European Safety Standard. Adjustable distance between the platform for different set-up pinch weld or frame vehicles. Lift with extra-low platforms: only 60mm.Platforms can be adjusted in length. 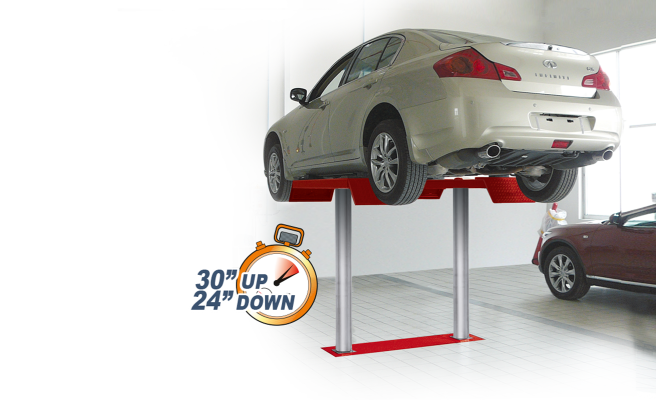 Lift for cars and vans, also with long wheel-base, up to an overall weight of 5500 kg. The carriages supporting the arms can be adjusted in width, in order to make the lift suitable for any application. Arms can be shifted along two lateral supports to position the vehicle on the body shop bench. Distance between columns 2.160 mm. Waterproof inground metal frame S1140A4. Minimal platforms height 140 mm: easy access also for cars with low spoilers.